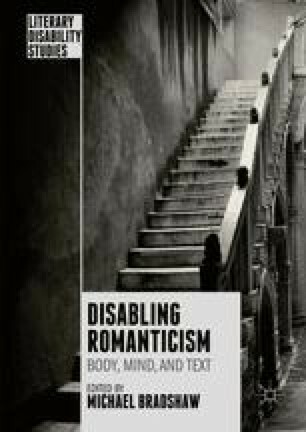 Rodas addresses rhetorical and narrative interstices of Frankenstein, exploring the ways in which the visible sutures of the novel defamiliarise intuitive language and social contact, bringing the reader into a complicit relationship with autism. Rodas observes that the creature’s hovel is simultaneously a container for the disposal of rejected creation and a sanctuary that shields the emergent self and allows it the privacy to develop: the space, and the being which inhabits it, constitute a representation of Romantic autism, an extreme of solitary self-ness, the ultimate expression of solitude. While the infamous ‘monster’ evokes the idea of the feral child that has often been associated with autism, however, Rodas proposes that Shelley’s novel provokes a more intimate relationship with autism than audiences might initially realise: the narrative strategies of the text bind the reader into a seemingly paradoxical experience of muteness and verbal precocity, and a correlative hyper-consciousness of boundaries—both rhetorical and social. Baggs, A. (2007). In my language. Online video clip. YouTube. http://goo.gl/QfYPVw. Accessed March 25, 2015. Carpenter, L. (2013). DSM-5 autism spectrum disorder: Guidelines and criteria exemplars. University of Washington Medical Center screening tools. http://goo.gl/MwY5tj. Accessed March 25, 2015. Harp, B. (2007). On the (autistic) use of parentheses. Square 8: Talk about squares, autism, and the number 8. Blogger: http://goo.gl/pD5VNY. Accessed March 25, 2015. Yergeau, M. (2013). Clinically significant disturbance: On theorists who theorize theory of mind. DSQ: Disability Studies Quarterly, 33(4). http://goo.gl/avJLFG. Accessed March 25, 2015.